Photo by Jessica Amaya for BrooklynVegan. Pairing a functioning Catholic Church in Brooklyn with some of today’s most innovative musicians might seem a bit unorthodox. However, upon seeing the Kranky Records showcase that kicked off 2011’s Northside Festival, it seemed a diabolically clever match. Pews normally filled with pious elderly women and their purplish helmet hair-dos were now filled to capacity with younger Brooklynites coming to worship at the feet of Adam Forkner’s one-man act, White Rainbow and Bradford Cox’s solo project, Atlas Sound. Partially for theatrics but most likely out of necessity (with no a/c the air was thick with humidity), the lights were turned down low throughout St. Cecilia’s Church. The space transformed into a surreal house of worship with abstract shadows cast along the grandiose altar; the setting sun streamed through stained-glass windows creating a warm ethereal glow, all under the watchful gaze of a enormous statue of Jesus. We arrived in time for the second act, White Rainbow, the ambient/new age/electronic/experimental/drone music project of Adam Forkner. His set was the most entertaining of the evening with heads bobbing in unison to his throbbing bass. As his set progressed concertgoers were drawn to their feet and dancing in the aisles. The Portland, OR musician was hunched over his laptop like a mad scientist, fiddling with a variety of knobs, pedals and buttons. A man of very few words, his songs became long psychedelic passages that blended seamlessly with one another, only enhancing the dream-like quality of the sticky June evening. 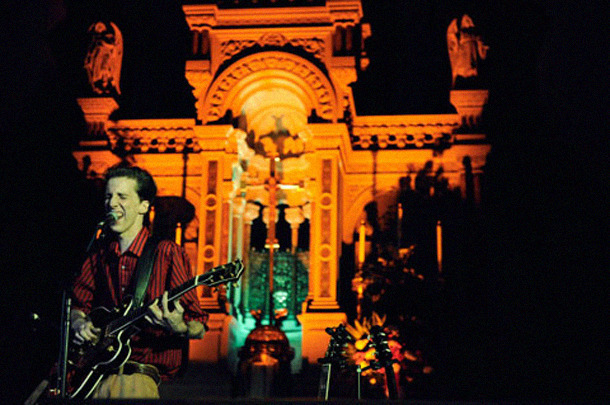 Bradford Cox of Atlas Sound took to the altar shortly after Forkner slipped away. The Deerhunter frontman was sure to advise the crowd to be respectful of their surroundings before even striking a single chord. Unfortunately the first few songs were plagued by technical difficulties but Cox soon regained his footing playing a mix of old and new material. The acoustics of the venue only strengthened his set, especially the more minimalist songs of his oeuvre. A man of many talents, he alternated between a handful of beautiful guitar and harmonica songs and utilized looped music with delayed feedback to flesh out the rest of his sound. By the end of the night Mr. Cox had the audience in rapture with his brand of ambient, experimental music. So much so that the applause did not cease until he reappeared for an encore. Charmingly though he forgot his prepared music and ad-libbed songs on the spot creating new music for all to behold. And after three tunes, the congregation of cool was released into the summer night.